35 stories on the Malaysian Airlines shootdown over eastern Ukraine in July 2014. On 17th of July 2014 Malaysia Airlines MH 17 was directed to vary its scheduled flight path flying over Ukraine en route to Kuala Lumpur from Amsterdam. Air traffic control ordered the playing to fly 200 km north of its original flight path. On Sept. 17 the Ministry of Defense of the Russian Federation held a briefing for members of the press, to present documented new evidence that the Ukrainian armed forces helped to bring down the Malaysian airliner that was flying over the Donbass in July 2014. The Russian Authorities continue to challenge the version that Flight MH-17 was brought to the ground by an air-ground missile. They declassified information contradicting the conclusions of the Dutch Commission of Inquiry Into the Crash. The absence of America’s so-called “intelligence” regarding the downing of Malaysia Airlines MH17 over Ukraine in a 34 page Dutch Safety Board preliminary report raises serious questions about the credibility and legitimacy of both America’s political agenda, and all agencies, organizations, and political parties currently behind it. First published on August 11, 2014, this article reviews the official Kiev government’s position concerning the downing of flight MH17, as confirmed by a statement of Ukraine’s Secret Service (SBU). Something unprecedented is happening in Ukraine. For decades the US and its proxies have committed war crimes with total impunity. They’ve trampled on just about every humanitarian convention there’s ever been, and the most they’ve had to fear is a Wikileaks-type exposé in a safely distant future. Video: Did A Ukrainian Fighter Plane Use Malaysian Airlines MH17 For Cover? Video: Take a Break and Fight! – CNN vs RT – RT Wins by K.O. Preamble: By popular demand of one Luis López, we present to you a little diversion – something out of the ordinary. A fight to the death between Peter Lavelle (Russia Today) and Chris Cuomo (CNN). Unfortunately, the occasion for the battle is inauspicious – the crash of the Malaysian Airlines Boeing MH17. Nevertheless, this battle is a microcosm of the world we find ourselves in, in which one side’s, Russia’s attempt to play by the rules is met with a saloon-style brawl by the other side, the US. “The intelligence and facts were being fixed around the policy.” Everyone remembers the Downing Street Memo, which unveiled the Bush/Blair “policy” in the run-up to the 2003 bombing/invasion/occupation of Iraq. The “policy” was to get rid of Saddam Hussein via a lightning war. The justification was “terrorism” and (non-existent) weapons of mass destruction (WMD), which had “disappeared”, mounted in trucks, deep into Syria. Forget about intelligence and facts. Well, aside from a few comments I’ve posted on Moon of Alabama, I’ve spent most of the time reading (when I’ve not been compiling) just about everything I could on the subject of the downing of Malaysian Airlines #MH17 and I think it’s pretty obvious that the Russians have been fitted up for this horrendous crime by the Kiev authorities (and possibly others) and, it must be said, they did a pretty bad job of it! If it wasn’t for the craven and complicit corporate/state media in the West simply not reporting on the actual events of the 17 July as they have been revealed, the reality of the frame would be obvious to everyone. The news of the crash of the Malaysian “Boeing 777″ split the whole world in just a few minutes based on a predetermined basis: “believe / do not believe” that the blame lies with Russia / U.S.A. / Ukraine / Donetsk. While the international investigation has not even started, most viewers and opinion leaders very quickly – after just fifteen or twenty minutes after the news related to the disaster started to arrive – already knew who were to blame. On the matter of MH17’s flight path, Malaysian Airlines confirms that the pilot was instructed to fly at a lower altitude by the Kiev air traffic control tower upon its entry into Ukraine airspace. 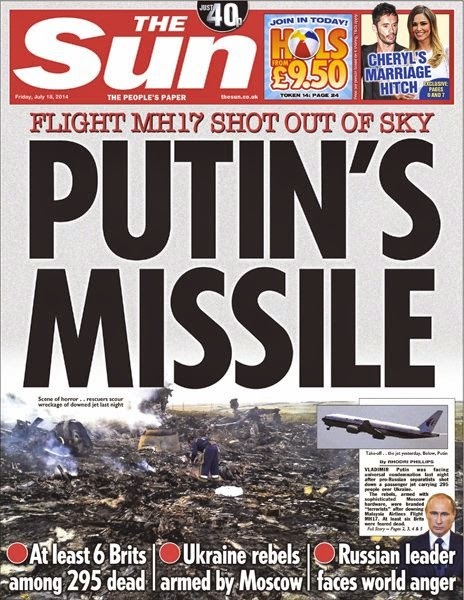 In the days since the downing of MH17 a lot of people have jumped to conclusions prematurely. Evidence provided by the Ukrainian Security Service, combined with the results of social media investigations, suggests the Ukrainian authorities have been less than honest in key disclosures of information to date. The level of unsubstantiated propaganda being directed against Russia regarding the downing of Malaysia Airlines flight MH17 has reached unprecedented lows. There is tangible desperation across Western media establishments, their political spheres, and within their corporate-financier funded policy think-tanks as they attempt to reassert their agenda and narrative not only upon the crisis in Ukraine, but upon the entire world as their weakening grip becomes apparent to all. The dangerous desperation emanating from the West follows the latest in a series of growing failures – the previous and most comparable being the loss of its proxy war against Syria and the desperate criminal conspiracy they unleashed in a failed attempt to save it. And here’s the spin war verdict: the current Malaysia Airlines tragedy – the second in four months – is “terrorism” perpetrated by “pro-Russian separatists”, armed by Russia, and Vladimir Putin is the main culprit. End of story. Anyone who believes otherwise, shut up. I cannot believe that I am writing this short essay, but I feel that I have to; I simply have no choice; I am a determined internationalist who does not believe in ‘blood’ and ‘nations’. We bring to the attention of GR readers, the following timeline Tweets by the Spanish Air controller at Kiev Borisopol Airport. CAPITALISM COULD COST US THE EARTH!